A hearty, comforting and filling vegetarian chili chock full of protein-rich lentils, butternut squash, onion, chiles, peppers, garlic, tomatoes and warming spices galore. Served alongside some perfectly complementary crispy & spicy chickpea quinoa crackers, you have one big, filling bowl of gluten-free, vegan, nutritious deliciousness perfect for an autumn's eve'! This amazing little dish is officially one of my new favorite things in the universe! It is just that good! I've now made this several times for my family and they all agree that it's a definite winner worthy of regular rotation during our weeknight meals. This easy and tasty vegetarian chili is full of nutrient dense ingredients and big on utterly delicious flavors! Throw in some spicy homemade chickpea quinoa crackers and this dish is just over the top ridiculously amazing! I hope you like it, too . . .
Spicy Chickpea Quinoa Crackers: Preheat oven to 325°F. Line a cookie sheet with parchment paper. Grease parchment paper with a bit of olive or coconut oil. In a large bowl combine quinoa, flour, and spices. Mix to combine. Gradually stir in water. Mix well. Pour cracker batter onto your greased parchment lined cookie sheet. Using a spatula, spread the batter into a thin and even layer. Bake for 25-35 minutes, or until crisp and edges are beginning to brown. Let cool and then break up into crackers.Lentil and Butternut Squash Vegetarian Chili:In a large pot over medium heat add olive oil, onion, garlic, chiles or jalepenos, and bell pepper. Saute for 5 minutes.Turn heat to high, and then stir in lentils, tomato sauce or salsa, broth, and spices. Bring to a boil, reduce heat, cover and simmer for 30 minutes.Stir in butternut squash. Simmer for 20 minutes longer.Turn off heat. Stir in cilantro and lemon juice.Salt to taste.Cover and let sit for 5-10 minutes before serving.Optionally, garnish with shredded cheddar cheese, sour cream (or yogurt) and fresh chopped cilantro. 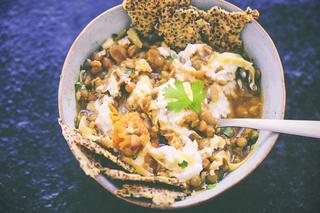 Serve with Spicy Chickpea Quinoa Crackers (recipe above).Enjoy!